Lacrosse is a team sport played in America, Canada, England, Australia and Hong Kong. It is played with a ball and netted stick with two teams of ten. At least 48 tribes of North American Indians originally played the game, known as "baggataway," as training for warfare, and it was later adopted by the French-Canadians. It was played with a 3 to 4 foot long cross stick (known as a "crosse") with a loop and net on the end. The ball was made of deerskin and stuffed with hair. Lacrosse gained popularity in the USA during the early 1900s, but by the 1930s it had declined. It has since become the Canadian national game, in the form of box lacrosse, and the field version of the game has been revitalized on high school and college campuses throughout the USA. Austin Danforth, Burlington Free Press. Burlington Free Press. Sunday, 21 Apr 2019 17:58:02 -0400. Highland Park ISD is condemning a racist remark made by a student on Instagram. Photo Credit: NBC 5 News. Meredith Yeomans. NBC. Tuesday, 09 Apr 2019 22:52:35 -0500. Box lacrosse is an indoor version of field lacrosse and was introduced in Canada in the 1930s. This version is played by two teams of six on hockey rinks where the ice has been removed or covered during the off-season. Indoor lacrosse is also popular in Canada and is played all year round with slight rule variations from box lacrosse. NCAA men's lacrosse is played on a field 110 yards long and 60 yards wide, with lines marked in white and cones at each corner. The team includes a goalie plus three defenders, three midfield players, and three attack players. The object is to maneuver the ball into the opponent's goal by carrying, throwing, or batting it with the crosse. Each goal is worth one point, and only the goalkeeper can touch the ball with his hands. The game is an hour long, divided into quarters. Play is started with a face-off from the center spot of the field. The two centers must have their sticks parallel to and touching the ground until the whistle start, when they attempt to flick or rake the ball past the opponent. All other players must remain where they are until one of the centers gains possession of the ball. Players may run, swerve, dodge, pass, or shoot the ball into the opponent's goal with the crosse. Fouls are classified as technical (such as being off-side) or personal (such as tripping and unsportsmanlike conduct). Penalties range from loss of ball possession to player suspension, depending on the nature of the infringement. The goals consist of two orange posts 6 feet apart, connected by a crossbar 6 feet high. Each goal is fitted with netting. 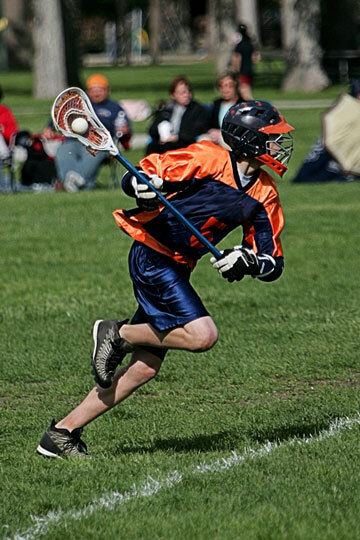 A short lacrosse stick is 40 to 42 inches long, while a long stick is 52 to 72 inches in length. The head usually measures 4-10 inches at the widest point, except in the case of the goalkeeper's stick, which measured up to 15 inches. The lacrosse ball is made of rubber, 7.75 to 8 inches in circumference, 5 to 5.25 ounces, and either white or orange in color. Players wear helmets with a face mask and chinstrap, gloves, and jerseys featuring the player's number. In NCAA women's lacrosse, teams consist of twelve players. First, second, and third home, right attack, left attack, and center comprise the offense (known as the attack). The goalkeeper, point, cover point, third man, and right and left defense comprise the defensive positions. Each position is marked by an opponent. No body contact is allowed in the women's version, and there are no off-side rules, making for a fast game with few interruptions. Women's lacrosse is comprised of two 25 minute halves. It is started from mid-field with the center players holding their crosses hip height in the air. The umpire places the ball between the crosses and states, "Ready, draw." On his command the centers must draw their crosses up and away from each other to ensure fair play of the ball. 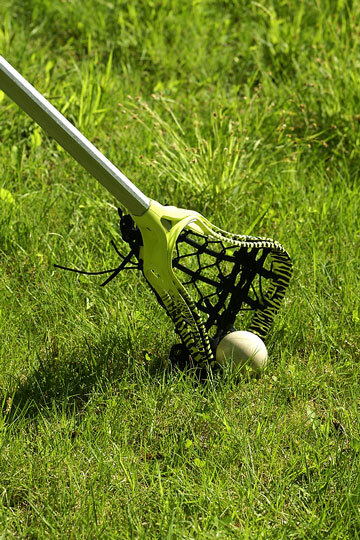 The ball in women's lacrosse has a circumference of 8 inches, a weight of 5 ounces, and may be any color. The sticks may be wooden, plastic, fiberglass, nylon, or leather, approximately one yard in length, and weigh no more than 20 ounces. The goalkeeper's stick may weigh up to 27 ounces. Players wear a shirt, short skirt or shorts, and rubber soled shoes. Goalies wear a helmet with face mask, chest pad, throat protector, gloves, and arm and leg pads. All players are required to wear mouthguards.